RESOLVED, That City Council requests that Planning Commission complete its review and report to the City Council by October 1, 2013. 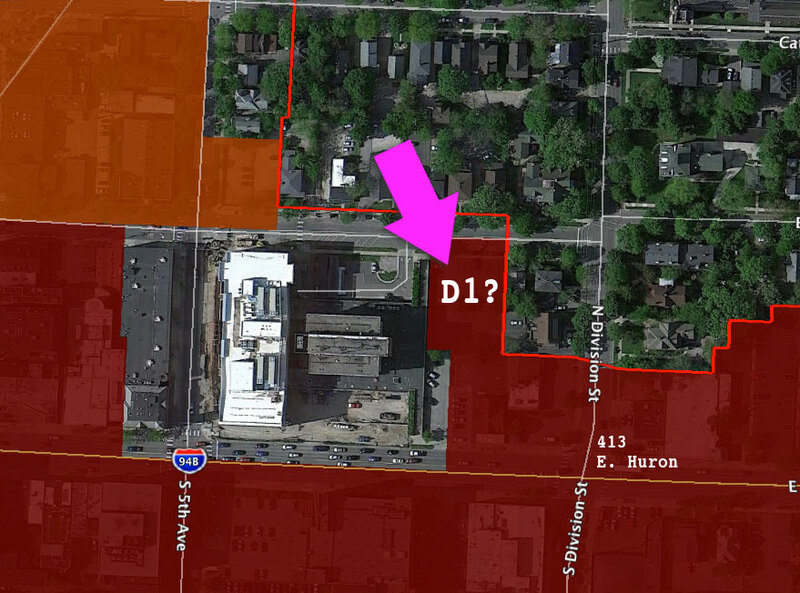 The parcel that the planning commission is supposed to consider downzoning is the parking lot currently owned by the University of Michigan Credit Union, formerly owned by the Ann Arbor News. The vote on the council’s specific direction came at its April 1, 2013 meeting, which leaves the planning commission six months to complete its work. The three points of inquiry are similar in spirit, but different in their details from those put forward by Christopher Taylor (Ward 3) at the council’s March 18 meeting. At that meeting, the council had deliberated on the question of whether to give the planning commission direction to conduct the D1 review and to impose a moratorium on the D1 site plans. The orange-ish area denotes an area zoned as D2 (interface). Darker red areas, including the UM Credit Union parcel (pink arrow), are zoned D1 (downtown core). 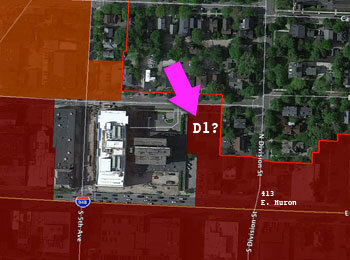 The red line denotes the boundary of the Ann Arbor Downtown Development Authority district. At their March 18 session, the council decided to delete the mention of a moratorium from their resolution and to include a promise to define by April 1 the scope of the planning commission’s review and a time frame for its work. The first point of inquiry adopted by the council on April 1 differs from that offered on March 18 by omitting mention of historic districts – although the appropriateness of D1 zoning will almost certainly include the relation of D1-zoned areas to historic districts. The second point of inquiry – about residential FAR (floor area ratio) premiums – had been proposed by Taylor on March 18. The third point of inquiry is new. The parcel in question is the surface parking lot currently owned by the University of Michigan Credit Union, formerly owned by the now defunct Ann Arbor News.